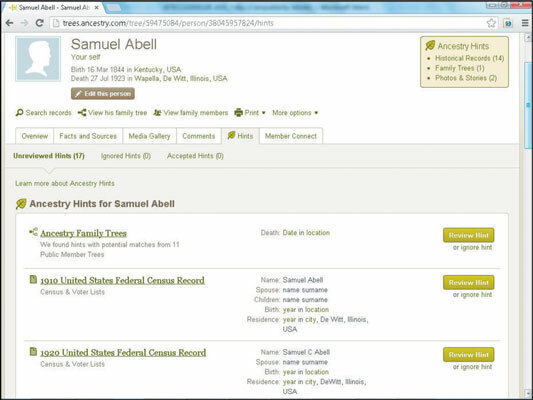 A special function in the online family tree on Ancestry.com is the Ancestry Hint. Ancestry Hints are designed to search through the names that you enter and match them to records available on the Ancestry.com website. Even if you don’t have an Ancestry.com subscription, you can use the Hints to point you to record sets that you may be able to find in other repositories. Display your family tree, and then open the personal profile for which you want to review Hints. The first column is the name of the record source. The second column contains information about the particular record containing your ancestor’s name. Note that this column doesn’t provide all the information that might be contained within the record; however, it gives you an idea of the type of information that matched the record with your ancestor. Click the Review Hint button to take a closer look at the record. If you have a subscription to Ancestry.com, you see more information about the record. If you don’t have a subscription, you see a splash page that advertises membership and explains how to start a free, two-week trial. If the Hint isn’t valid for your ancestor, click the Ignore Hint link. Ignoring the Hint doesn’t delete it from the profile. The Hint is moved to the Ignored Hints page, where you can review it again by clicking the Ignored Hints link.